I’m grateful You’re All Surrounded is finally over and somewhat glad that I stuck around to recap til the end. There was nothing memorable about this drama but as an entertainment offering its sheer mediocrity in every aspect makes for a strange experience to sum up. I like it but that stems from liking the two male leads Lee Seung Gi and Cha Seung Won, both of whom did everything acting and charisma-wise needed to sell their end of the bargain. Everything else was just dull and simplistic to the point of being childish, so many times watching YAAS required dialing down the interest to a level of reading a children’s book. The big conspiracy sputtered to a conclusion by hitting even more lucky case-solving breaks and basically having the bad guys all trip over their own petards. The good cops of the Gangnam precinct did their jobs, some paid steeper prices than others in the process, but the conclusion was the sort of happy life-goes-on montage that would have worked if this drama managed to sell all the characters and their intertwined life experiences through the 20-episodes worth of storytelling canvas. Sadly it failed to develop real narrative grist so the happy ending didn’t provide the audience with the commensurate happy feeling. It’s like drinking non-alcoholic beer and not getting the buzz. Too bad I want my beer with the buzz because otherwise I’d just drink soda for the sugar. Episode 1 of YAAS remains the best episode and the reason so many checked it out and stuck around hoping the quality would be sustained. The police procedural elements remain the weakest link but the dual romantic paths also failed to ever go anywhere. Pan Seok and Sa Kyung had all the necessary ingredients to showcase a poignant divorced-couple reuniting plot but the drama did nothing with it other than one date. Dae Gu and Soo Sun work better as friends than lovers and the romance between them was more supportive than sizzling. The rookie friendship story was the strongest element around but it was broken up haphazardly throughout the drama so there was never any momentum. Ultimately this is a drama that is watchable but without any expectations and the judicious use of the FF-button. Was it a failed offering by SBS? Not really, but as a waste of the assembled acting talent then it definitely deserves an F-grade. 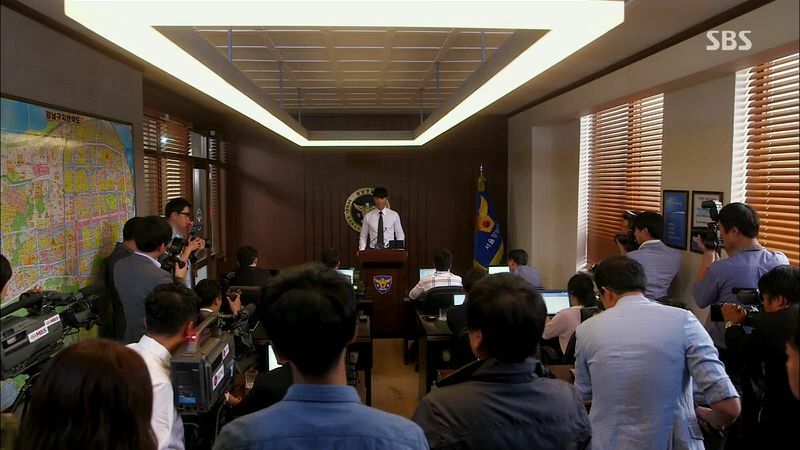 Pan Seok takes off his police uniform and holds a press conference to expose the cover-up behind the murder of Chief Kang and the conspiracy surrounding the earlier cover-up of the Masan murder. He plays the Killer Boots recording where Congressman Yoo told Killer Boots to fake the paternity test so that Madam Yoo would believe that Kim Ji Yong was her husband’s illegitimate son. 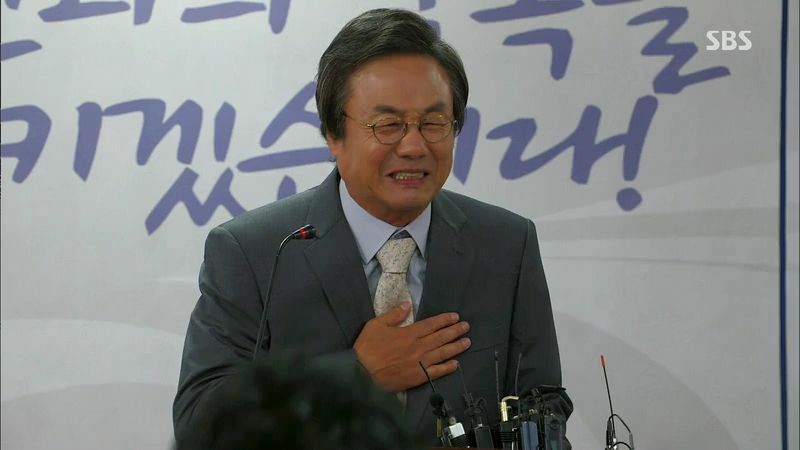 The media gasps at the recording and Pan Seok explains that Madam Yoo attacked Ji Yong’s mom under the mistaken assumption created by her own dad Congressman Yoo. Pan Seok says Congressman Yoo is trying to pin all the blame on Madam Yoo now which is why he’s putting the job on the line to expose the evidence that implicates a greater conspiracy. He doesn’t believe justice is dead and hopes the gathered media will join him in pursuing the truth. Team 3 and Sa Kyung watch in anguish as Pan Seok basically flushes his entire career down the toilet for this case. Internal affairs arrives after the press conference and takes Pan Seok away for investigation into secretly investigating the case and releasing evidence to the public against protocol. Pan Seok leaves with them and tells the rest of his team to keep investigating. Pan Seok’s big press conference is splashed all over the newspapers and Congressman Yoo can no longer hide his involvement or his daughter’s actions in the Masan murder. He angrily breaks some glass in his office while his lawyer gets a call from the prosecutor’s office. Madam Yoo is being questioned about whether she hired someone to kill Chief Kang and she screams back that she doesn’t even know who that person is so why would she hire someone to kill her. Madam Yoo confronts her dad afterwards about setting her up to almost kill a person and he’s not even apologetic and thinks he did the right thing to try and get Madam Yoo to divorce Mr. Shin. How could she cling to the empty shell of a man and not even take her father’s side. Madam Yoo asks who the dead Chief Kang is and hears that she helped clean up Madam Yoo’s mess eleven years ago. Madam Yoo screams that the situation would have never happened if her dad didn’t fake the paternity test! Madam Yoo cries and says no wonder her mom didn’t leave any money to her dad when she died and left it all to her daughter. Congressman Yoo warns his daughter that she’s currently out on bail and better be careful otherwise she’ll be back in lockup. Director Cha informs Team 3 that the prosecutor’s office will be re-investigating the entire case and has reassigned Team 3 to do it. He hands them latest gadgets to help their investigation including a small hidden recording device. Ji Gook reads the breaking news online that Congressman Yoo is resigning his position. Congressman Yoo holds a fake tearful press conference where he apologizes to his daughter and pats his chest to take all the blame. Ugh, he’s so nasty. He then declares that he won’t accept the false accusation that he ordered the hit on Chief Kang. He will use whatever integrity remains to cooperate with police investigation in order to clear his name. He bows low in apology but secretly smirks. Dae Gu interrogates Congressman Yoo while the rest of Team 3 watch behind the one-way mirror. They decide to ask basic questions since Congressman Yoo came in earlier than they expected so they aren’t prepared. Dae Gu cuts to the chase and calls him by his full name rather than respectfully as Congressman Yoo. 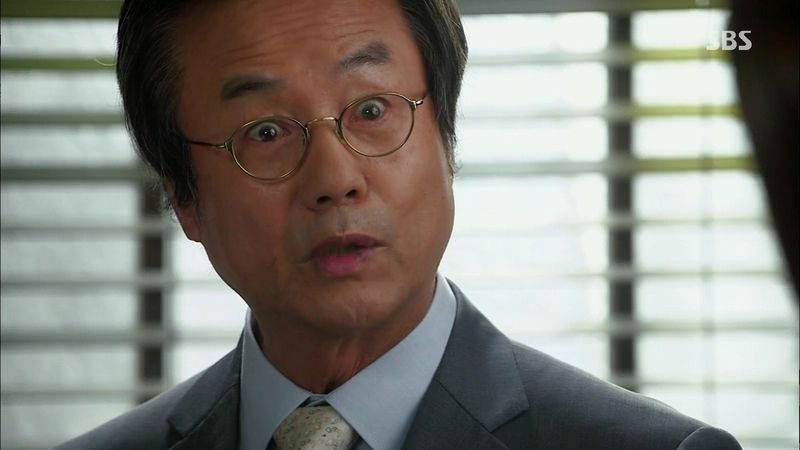 He knows Chief Kang went to see Congressman Yoo right before she was killed and Congressman Yoo was the one who called the lawyer and it wasn’t Madam Yoo. 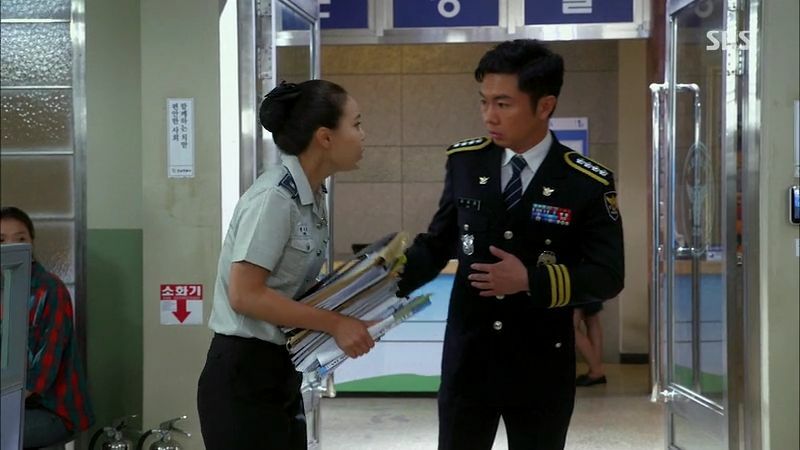 Dae Gu saw Chief Kang angrily leave the meeting so they must have argued. Congressman Yoo says its sad that Chief Kang is dead otherwise she can clear his name. Congressman Yoo changes the subject to Chief Kang being Dae Gu’s benefactor and asks if he knows why she did it? Dae Gu loses his temper and changes the question to Congressman Yoo ordering Killer Boots to kill Kim Ji Yong eleven years ago. Congressman Yoo denies it all but Dae Gu says Chief Kang admitted it all. 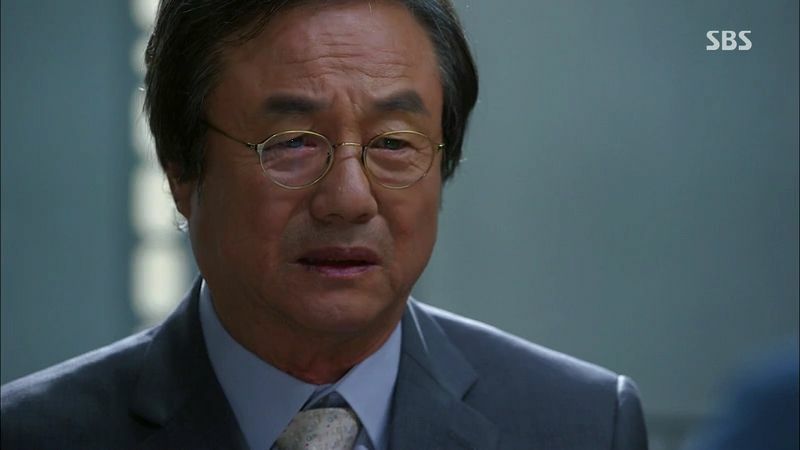 Congressman Yoo tsk tsks that Dae Gu must feel so betrayed by Chief Kang. Dae Gu screams at Congressman Yoo for being inhuman in ordering a hit just to become a politician. Congressman Yoo isn’t cowed by the questions and points out that dead men tell no tales and now Killer Boots and Chief Kang are both dead. Congressman Yoo gets up to leave and throws in one more “poor Chief Kang” to goad Dae Gu. He succeeds because Dae Gu angrily pushes him against the wall. 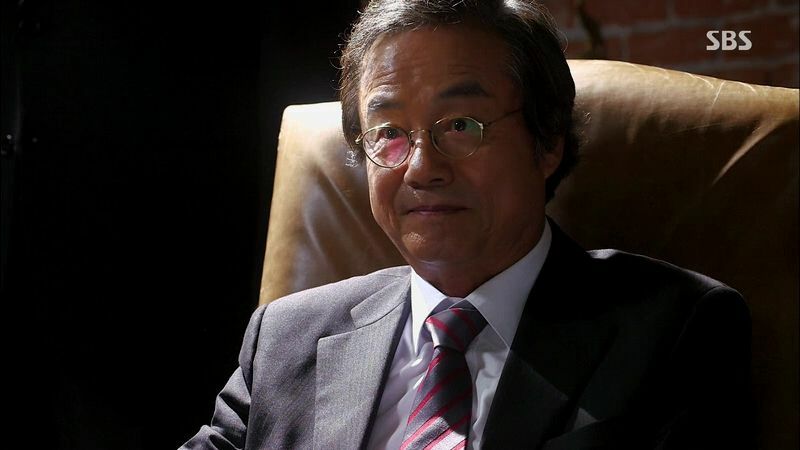 After Dae Gu is pulled off him, Congressman Yoo can’t believe that Chief Kang used a little bit of money and managed to buy Dae Gu’s loyalty. He orders his lawyer to take the recording that shows Dae Gu attacking him. 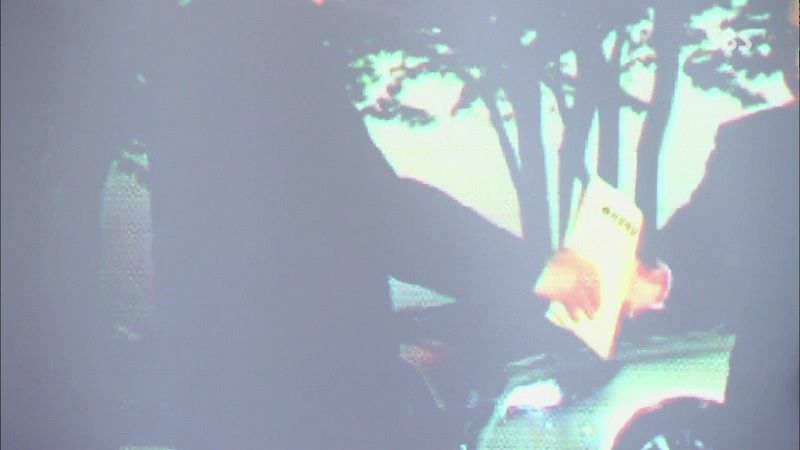 Eun Do hands the CCTV footage from around Congressman Yoo’s residence to Pan Seok at his request. 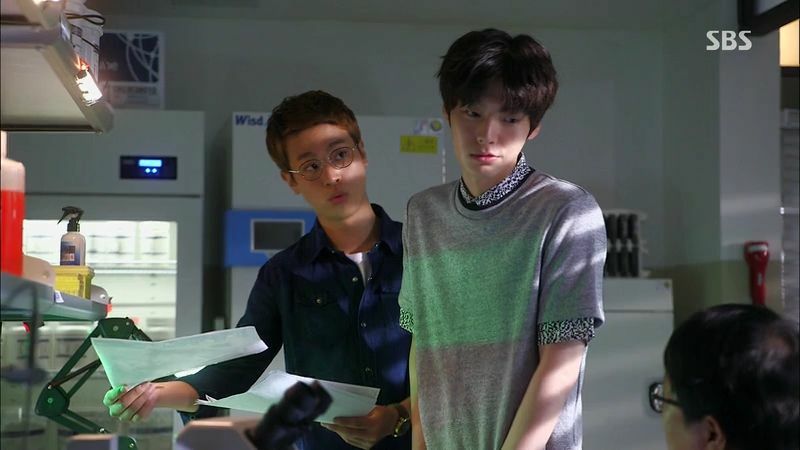 Eun Do orders Pan Seok not to get fired because he still needs him otherwise how can Eun Do support his five kids. 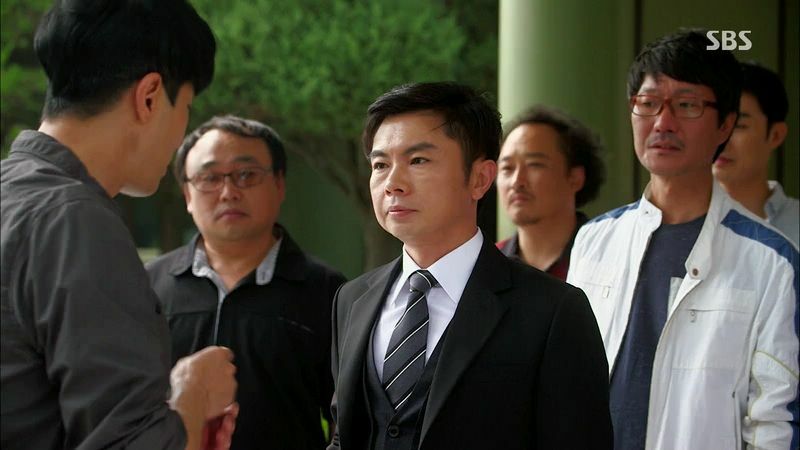 Dae Gu watches the recording of Killer Boots handing something to the lawyer and notices that the bag has a different logo on it than the current Cha Sung group logo. His research reveals that the logo on the bag is from an old Cha Sung Group logo that was retired eight years ago, so whatever was in the bag is likely information from even earlier than that, probably from the incident eleven years ago. Which means the lawyer didn’t pay Killer Boots to kill Dae Gu but paid him for whatever was in the envelope that could solve the crime from eleven years ago. Soo Sun stares at the picture and thinks it could be an old cell phone in that envelope and likely contains a recording from eleven years ago. The Cha Sung Group board meeting ends with furious stockholders storming out while the employees are grateful. Mr. Shin calls his wife to announce that he’s given all his shares to the employees and now the company is an employee-owned enterprise. So random. Madam Yoo screams about the shares she was planning to give to Ki Jae. Congressman Yoo hears and hopes that Madam Yoo kept some of her shares but she screams that she transferred all her shares to Ki Jae because her dad had her committed to a mental hospital. Now Ki Jae also transferred his shares to the employees. Both father-daughter scream at each other for ruining their lives. Ahahaha, awesome result except pretty lame execution. Congressman Yoo gets a picture from Dae Gu of the envelope with the cell phone and then a call informing him that the lawyer will be handing over the cell phone tomorrow to the cops. Dae Gu suggests Congressman Yoo turn himself in and ask for leniency. Congressman Yoo calls his lawyer and accuses him of betraying him. The lawyer insists he disposed of the cell phone but Congressman Yoo orders him to bring the phone to him immediately. The lawyer drives to a used bookstore while Soo Sun and Ji Gook follow him. The store is owned by his sister and he runs to his old bedroom and retrieves the envelope with the cell phone inside. Ji Gook pretends to be a guy checking out the lawyer’s car and suggests that he go take it to a nearby car wash. After the lawyer drives off, Ji Gook pretends to be his assistant and goes inside to grab something he forgot. The sister lets Ji Gook in and he rummages through the room and finds the envelope with the phone in it. Well that was easy peasy. Ji Gook hands the phone over to the rest of the rookies when suddenly a group of men with bats show up. The rookies make a run for it and split up with Dae Gu and Soo Sun running in one direction while Ji Gook and Tae Il take off another way. Soo Sun and Dae Gu are cornered in an alley and taken hostage to the basement lair of Congressman Yoo. He orders the recording in the cell phone in Dae Gu’s possession played and inside is the very recording where Congressman Yoo orders Killer Boots to kill Dae Gu’s mom and the boy as well as clean up the crime scene so there is no evidence of Madam Yoo having been there. Dae Gu furiously tries to rush Congressman Yoo but is held back while the Congressman blames Dae Gu for surviving since he should have died eleven years ago. Dae Gu’s presence is a thorn in Congressman Yoo’s side that he’ll remove now. 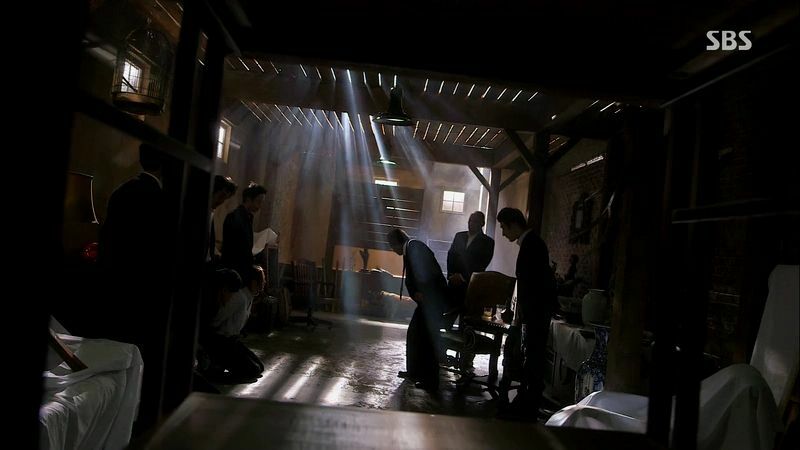 Congressman Yoo orders the men to kill both Soo Sun and Dae Gu as gets up to leave. Dae Gu tries to buy time and offers to kill himself since his suicide will never be tied back to Congressman Yoo but in exchange he wants them to release Soo Sun. He tells Soo Sun to testify that Dae Gu killed himself. Congressman Yoo likes the idea and has Soo Sun dragged out kicking and screaming for Dae Gu not to do this! Congressman Yoo sits down to watch Dae Gu shoot himself in the head and Dae Gu takes the gun and points it at his own head but asks one final question about whether Congressman Yoo ordered the hit on Chief Kang. Congressman Yoo admits it and also admits that he had Killer Boots killed as well. Dae Gu tosses the gun down and stands up, refusing to kill himself for Congressman Yoo and taunting him to kill Dae Gu himself and get more blood on his hands. We see Eun Do driving with Tae Il and Ji Gook to follow Dae Gu’s trail to find them. Ji Gook gets a live streamed video of Congressman Yoo pointing a gun at Dae Gu since he has a video recording placed on his collar. Dae Gu tells Congressman Yoo to shoot him because he’s still going to jail for all his crimes even if Dae Gu dies. 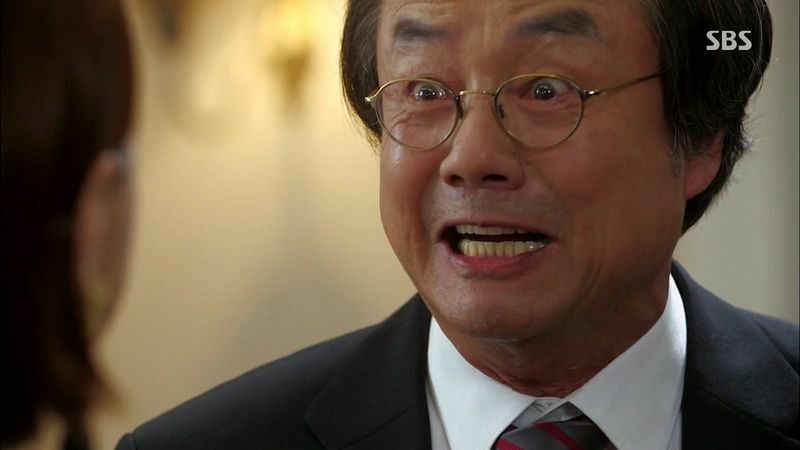 Pan Seok arrives and disarms the men and stops Congressman Yoo from shooting Dae Gu. 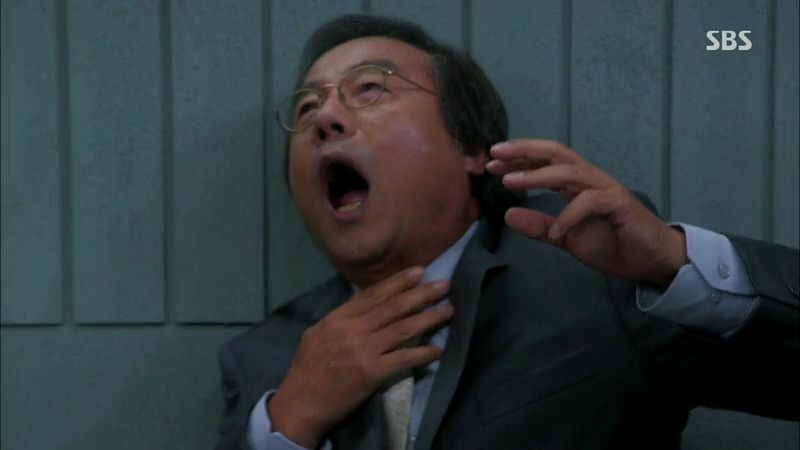 Eun Do and the rookies arrive on scene and hear a gunshot go off. They run to the basement to see Dae Gu slapping handcuffs on Congressman Yoo and arresting him for the litany of murders. Eun Do wonders how Pan Seok arrive before them and then laughs at him using a toy gun since he’s currently placed on probation and can’t carry a gun. Soo Sun comes down and is so relieved to see Dae Gu is fine. Everyone leaves and the two of them tearfully hug each other. Soo Sun warns that she’ll kill him first if he dares do something like that again. 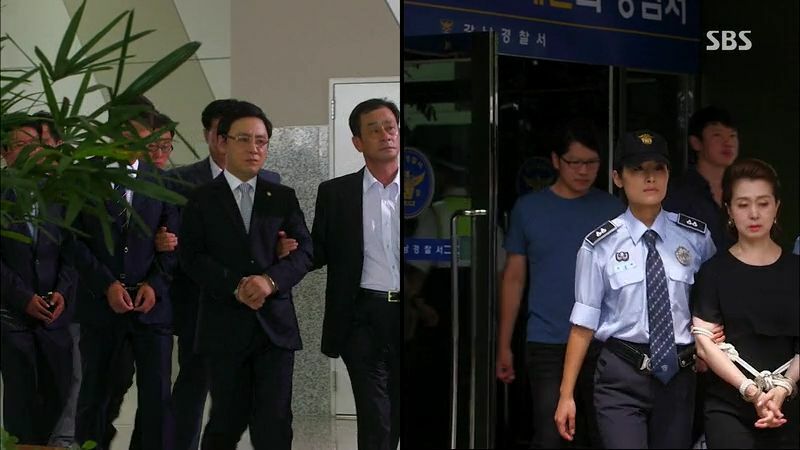 Congressman Yoo, Madam Yoo, and the lawyer are all arrested while poor Ki Jae screams for his mom as she’s taken away. The rookies sit down to eat and marvel at how they caught Congressman Yoo. None of them really wanted to be cops and they made the Gangnam precinct into a disaster zone at times, but they still did their jobs ion the end. Dae Gu wonders how Pan Seok’s disciplinary hearing tomorrow will go and Soo Sun hopes that he’ll create another legend by getting through. Pan Seok explains to the disciplinary board that he is willing to accept any punishment because he was doing his job and bringing hope to his team. Pan Seok leaves Gangnam precinct and Director Cha hands him a talisman to keep him safe. Eun Do promises to visit Pan Seok on his days off while Ji Gook sadly hugs his departing team captain. Pan Seok smiles as he gives everyone another look and Sa Kyung gestures for him to call her. Pan Seok drives off while Eun Do tries to keep himself from crying. A year later, Pan Seok is now a local police precinct director in the countryside and he’s investigating an ahjumma who got her chickens stolen from her coop. He gets a package and goes back to the office to open it. Inside is a group photo of the Gangnam precinct team along with a letter from Soo Sun detailing how everyone has been. She writes that Gangnam precinct is still the same and everyone is doing well. Director Cha is now Chief Cha but he’s become really nice and rarely loses his temper. Eun Do was investigating pickpockets and accidentally solved a domestic terrorism case and got a medal from the president. His wife is also pregnant with their sixth child. Tae Il is interested in forensics now which taps into his medical background while Ji Gook and a cute lady cop are dating at work. Soo Sun and Dae Gu are still partners but also a couple. We see them sneak kisses in the evidence locker like kids. Soo Sun promises to visit Pan Seok when she has time because she misses him so much. She signs her letter “forever your kid, Eo Soo Sun”. Pan Seok gets called out by a visiting Sa Kyung but their date is interrupted when the chicken thief rides past on a scooter. Pan Seok chases after him and Sa Kyung joins in the pursuit. Back at the Gangnam precinct, Team 3 is called out on an assignment and they take off. Pan Seok and Sa Kyung corner the chicken thief together while Team 3 not-rookies-anymore walk out together to a case. Click here to watch You’re All Surrounded. Koala harsh to the end lol. I enjoyed the ending very much despite its flaws. F grade is harsh, I give it a C on the police portion, B for the friendship, A for CSW/SG’s acting and A for OTP romance that kept me on this drama to the end. isn’t that a double negative? :] …you meant an A for “wasting the talent”. Wow! Can’t believe it has ended. The drama’s shorter than I thought it would be. The only things I would remember the most are Hyung Chul’s deep voice, and when Dae Gu goes crazy. Don’t forget Congressman Yoo hamming it up and Madam Yoo screeching every other line of dialogue. Beside all the flaws, I like the ending, and overall, I like the drama. The kiss at the end is soo sweet and I like some ending scenes which mirror the first episode. It ended! I’m so gonna cry. I’ll miss watching Daegu oppa. But also the p4 group together. But most of all my OTP couple. They were so sweet together. The ending was satisfying enough for me. Ms koala, since you are done with this drama. I want to recommend another called marriage, not dating. I am certain you will love it especially the OTP. Been watching that one since the beginning but thanks for the rec! Marraige not Dating is good! Have you checked out King of High School? Also, how are you liking Fated to Love You? Ok….so he never found out that Mr. Team Leader’s son dead on the day his mother was killed? Talking about a major missing. I also felt that he should have said/done more than the salute and the sorry thanks. The reason for his mom’s death was pretty weak ….I hated the birth secret but that was more durable. How come his fake dad did not reveal the truth about his birth upfront? It was a nice ride, but not one that I would watch over again like Master’s Sun. I also throw in a vote for Marriage Not Dating – I love that drama! 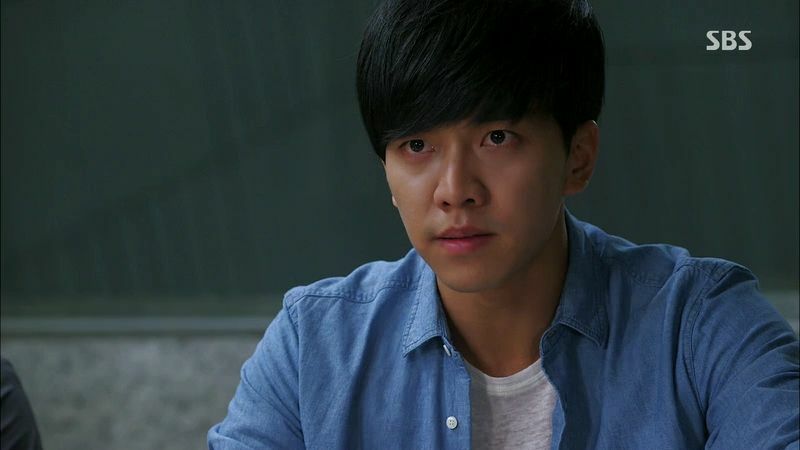 What this mediocre drama did best was make me desperately want to re-watch King2Hearts so I could see LSG at his best & IN HIS BEST ROLE. I was reminded in spurts of why I love him so much. I just love him more when the drama is worthy of him. Ditto for Cha Seung Won. Maybe I’ll go rewatch City Hall or Greatest Love. So who is his real father? and why did Chief Kang became his benefactor?